On Monday morning (01/19/15) at about 12:07AM, our cameras caught an altercation between an invading great horned owl and a defending bald eagle parent. While we've seen brief nest invasions before, we've never seen owls that appear determined to take over the nest. We've had a lot of questions and I'll attempt to answer the most commonly asked here. Don't Owls Nest In Cavities? Owls may nest on ledges, dense brush, cavities in trees, holes in the ground, and nests built by other birds. Unlike many birds, owls don't usually make their own nests. Cavity-nesting owls can't drill holes in trees, so they utilize holes made by woodpeckers, rot, or broken branches. While burrowing owls can dig, they prefer to take holes excavated by prairie dogs, skunks, armadillos, or tortoises. Owls that prefer stick nests take nests made by other birds instead of building their own. Our ideas about owls and cavity-nesting are probably influenced by the 20th-century decline of large nest-building raptors like bald eagles and red-tailed hawks. With fewer bald eagle and red-tailed hawk nests to steal, great horned owls might have been more likely to use cavities. But with bald eagle and red-tailed hawk populations on the rise, there are more nests and great horned owls might be back to taking them. When is it adopting and when is it stealing? According to much of what I've been reading on the subject, great horned owls often adopt red-tail hawk nests. Since red-tailed hawks aren't using their nests in January and February, it doesn't seem much like stealing to me. Unfortunately, bald eagles and great horned owls both lay eggs at roughly the same time. 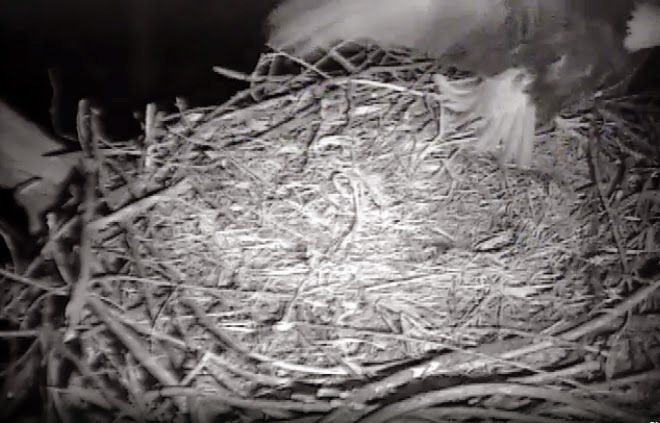 When Mom and Dad are trying to use the nest they built, our feelings change. How dare those owls steal another bird's nest! Interestingly, a lot of what I read talked about red-tailed hawks using nests for just one year. While RTH don't always build new nests, do those that do build a new nest every year because they are behaviorally programmed to do so (as was suggested in much of the literature), or do nest adopters help drive their behavior? Great horned owls nest earlier than red-tailed hawks, but their seasons overlap just enough to require replacement nest building on the part of the red-tailed hawks. Why Aren't The Owls At N1? We remember N1 as a large bowl surrounded by sticks and filled with grass and cornhusks. But Mom and Dad aren't replenishing it any more. As recent camera work has shown us, the surface is cold and bare and the nest, which is compacting under its own weight, has flattened. While we don't know for sure, I suspect the owls find the soft grasses and bowl-like shape of N2 much more inviting than the barren exterior of N1. Could The Owls Take Over N2? I can see three possible scenarios for the nest. In scenario one, the owls begin laying eggs in N2 at night while the eagles are roosting elsewhere. When the eagles come to the nest the following morning, they find it defended by a pair of owls. In scenario two, the owls keep tangling with the eagles and the eagles abandon the nest. I don't know whether they would reclaim N1, try to build a new nest, or attempt to take over an existing nest somewhere else. In scenario three, as the eagles begin to roost more in the N2 tree at night, it's possible their presence would be a deterrent and/or the eagles would continue to try and drive them away. All scenarios are speculation and we will just have to wait and watch nature take its course. How likely is a nest takeover? Great horned owls are about a third the size of bald eagles, but they are formidable opponents. Unfortunately, I couldn't find much data on nest takeovers, and anecdotal evidence wasn't helpful in figuring out who would probably win. I'd bet on whoever lays eggs first, but even nesting birds have been driven away by nest invaders. Would The Owls and Eagles Be A Threat To One Another's Young? This nest had been used for years by Bald Eagles, each annual addition of materials increasing the height until it reached fifteen feet up between the main forks of the tree. At the bottom it was eight feet through, where it was jammed in between the forks, and from here it tapered to four feet, ten feet up, and again spread out to six feet on top where the two Eagle eggs rested on soft, dry grass in the rudely-formed depression. Four feet from the bottom of this huge pile of branches and debris was the Owl's home, containing two freshly laid eggs. So in short, I don't know. Bald eagles and great horned owls overlap in a lot of places, they don't compete for exactly the same food base, they forage at different times of the day, and the vicinity is well-stocked with prey. We'll be watching intently (and asking for your help with documentation) if they end up nesting in close proximity. We will continue to watch the nest or nests regardless of who ends up nesting in them. No. This is a natural event and we believe it would be unethical to interfere. Beyond that, our permits don't allow us to take healthy owls and interference could easily do more harm than good. If an eagle or owl is hurt, we will do our best to find it and get it to a rehabilitation facility. Will The Owls Take Advantage Of The Hatchery?What do great horned owls eat? Like eagles, almost everything. Cornell University tells us that they eat mostly mammals and birds—especially rabbits, hares, mice, and American Coots, but also many other species including voles, moles, shrews, rats, gophers, chipmunks, squirrels, woodchucks, marmots, prairie dogs, bats, skunks, house cats, porcupines, ducks, loons, mergansers, grebes, rails, owls, hawks, crows, ravens, doves, and starlings. They supplement their diet with reptiles, insects, fish, invertebrates, and sometimes carrion. Having said that, they have a real preference for mammals. I don't think they would take advantage of the hatchery unless mammals were in very short supply. We would like the eagles to stay in the nest and be productive. If that doesn't happen, we would like the nest takeover to occur without injury or loss of life to the eagles or the owls. More than anything, we hope that they don't engage in a prolonged inter-species conflict that results in the maiming or death of young. We won't interfere with life in the nest but as I stated earlier, if an eagle or owl is hurt, we will do our best to find them and get them to a rehabilitation facility. Remember that while both species have serious talons and beaks, conflicts don't have to involve injury. A video chronology of owls at N2. Please let me know if the comments if I'm missing one.